Although I'm usually not that into celebrities clothing or jewelry lines, I'm actually really loving Nicole Richie's House of Harlow current jewelry collection. Well, of course, when geometric shapes and tribal accents are involved, I'm easily sold... Hope you like them too! 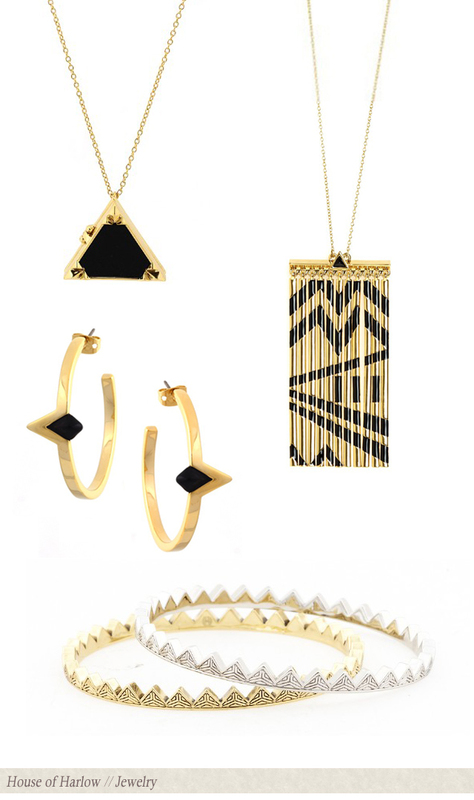 Black Leather Triangle Locket Necklace ($80) // Metal Fringe Necklace ($135) // Black Triangle Hoop Earrings ($40) // Engraved Triangle Bangle Set ($110). My favorites: metal fringe necklace and triangle bangle set. The name House of Harlow is great - who knew her daughter's name would be the perfect jewelry line! I want the bangles and the triangle locket! I'm the same way - not at all a fan of most celebrity fashion lines, but I'm absolutely determined to own at least one House of Harlow piece. I actually like this collection better than her last. It's a little more edgy, but I'd totally wear all of the pieces you've shown!